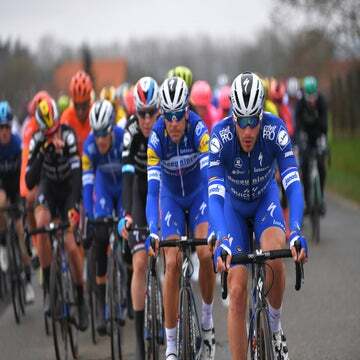 WEVELGEM, Belgium (VN) — Elia Viviani was boxed-in during the final sprint by former teammate and foe Fernando Gaviria, leaving the dominant Deceuninck-Quick-Step empty-handed in a chaotic and intense Gent-Wevelgem. Alexander Kristoff (UAE-Emirates) kicked to a surprising victory in the windy and hard-fought edition of Gent-Wevelgem. Viviani was hoping to make amends for his tearful close call in last year’s lost to Peter Sagan, but this time, he was gnashing his teeth in frustration. 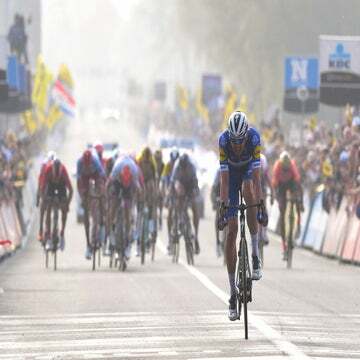 A dejected Viviani eventually crossed the line in 19th as a reduced bunch came into Wevelgem after a hard-fought battle that saw Deceuninck caught out early in the race. A big group pulled away in the first hour of racing in gusting crosswinds, and the team’s workhorse Tim Declercq was the only man to make the move. The Belgian super-team was going to have to work. Philippe Gilbert, Yves Lampaert and E3 BinckBank Classic winner Zdenek Stybar starting tapping away, slowing reeling in the group that included defending champion Peter Sagan (Bora-Hansgrohe). With 70km remaining, the group had been whittled down to just five riders: Sagan, Edward Teuns (Trek-Segafredo), Mike Teunissen (Jumbo-Visma), Matteo Trentin (Mitchelton-Scott), and Luke Rowe (Sky). When the group came into the finish straight, all eyes were on Viviani. But Viviani was watching Kristoff, who showed signs of his former self with a strong ride over the Kemmelberg. Video replay shows Gaviria protecting Kristoff’s rear wheel. John Degenkolb (Trek-Segafredo) and Oliver Naesen (Ag2r-La Mondiale) found daylight in the middle of the road to claim second and third, respectively. Viviani was boxed-in, and had nowhere to go. It was a bitter disappointment for Viviani, who has put the “sprinter’s classic” at the top of his career goal, alongside Milano-Sanremo.